MONDAY, May 14, 2018 (HealthDay News) -- Progress made in limiting kids' exposure to secondhand smoke could be undermined by the increasing popularity of pot, a new study suggests. "As we are removing cigarette smoke -- and that's a major public policy achievement -- that success will be attenuated by increasing exposure to secondhand marijuana smoke," said lead researcher Renee Goodwin. The numbers confirm the trend. Fewer parents are smoking cigarettes who have kids in the home these days -- about 20 percent in 2015 compared with more than 27 percent in 2002. But marijuana use among cigarette-smoking parents increased dramatically during that same period, indicating that kids in those families could be exposed to more secondhand smoke than ever. Among parents who smoke cigarettes, pot use increased from 11 percent in 2002 to over 17 percent in 2015, the researchers found. "The kids who are already exposed to one thing, they're more likely to be exposed to both," said Goodwin, a professor with the City University of New York. "It's even worse for them." Kids exposed to a combination of secondhand smoke from pot and tobacco are more likely to wind up in the emergency room or suffer an ear infection, according to another study presented earlier this month at the Pediatric Academic Societies annual meeting in Toronto. In the latest study, Goodwin and her colleagues also found there's been an uptick in marijuana use among parents who don't smoke tobacco, from 2 percent to 4 percent during the same period. However, marijuana use was nearly four times more common among cigarette smokers versus nonsmokers, the findings showed. "Overall, cannabis use is much more common among cigarette-smoking parents versus nonsmokers, but it is increasing in both groups," Goodwin said. 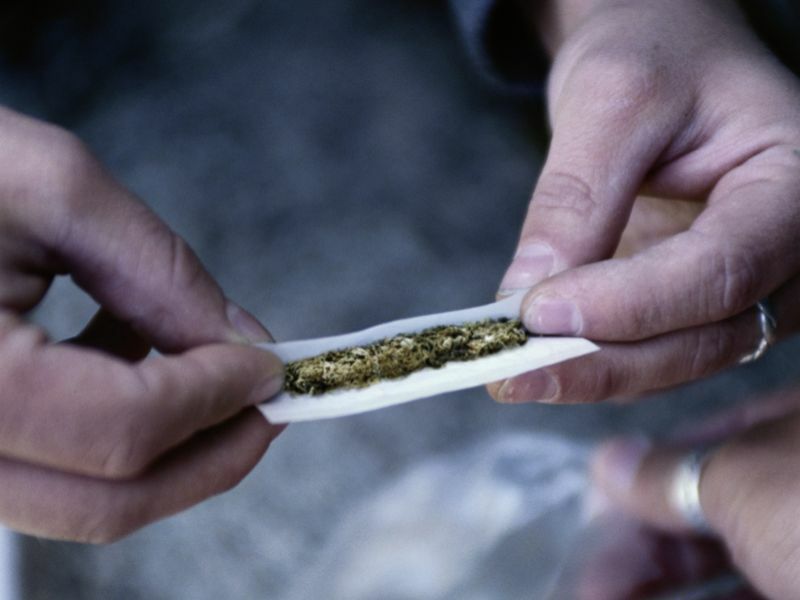 The trend toward marijuana legalization prompted the research team to look at whether parents are smoking pot more often around their kids. Goodwin explained that she has a friend who works with a government agency in Colorado who often encounters casual marijuana use in other people's homes. "He knocks on people's doors, someone comes to the door, a puff of cannabis smoke comes out and there's nothing wrong with that. It's not illegal," Goodwin said. "That's fine. But it is secondhand smoke." To investigate, the researchers evaluated data from the federal National Survey on Drug Use and Health, an annual and nationally representative survey. There isn't a lot of evidence at hand about the health effects of secondhand marijuana smoke, Goodwin noted. But what is available suggests that it is likely to be harmful, said Dr. Karen Wilson, division chief for general pediatrics at the Icahn School of Medicine at Mount Sinai, in New York City. Wilson noted that a recent study in Colorado found about 16 percent of kids hospitalized for a lung infection called bronchiolitis had blood markers showing they'd been exposed to marijuana smoke. Worse, about 46 percent of the kids had been exposed to both tobacco and pot smoke, Wilson said. "This is a significant concern, and one we're hearing more about even in places like New York City, where smoking marijuana is still illegal," she added. Nine states plus the District of Columbia have legalized marijuana for recreational use (Vermont's new law will take effect July 1), and 30 states plus the District of Columbia have approved medical marijuana. Goodwin noted that this could be leading to a culture where parents think it's OK to smoke pot in front of their children. "People drink beer in front of their kids," Goodwin said. "If marijuana is legal in your state, are people more likely to use it around their children?" Studies have shown that early marijuana use might alter a child's brain development and make them more susceptible to drug abuse. Researchers are concerned that secondhand pot smoke might deliver a similar effect, Goodwin and Wilson said. "We do suspect kids exposed to secondhand tobacco smoke, their nicotine receptors are primed to make them more susceptible to cigarette smoking," Wilson said. "It's too early to say whether the same is true for marijuana smoke, but we wouldn't want to ignore that as a possibility and then have that become the case. We want to protect children now." Goodwin suggested that public messaging about the dangers of secondhand smoke be expanded to include pot smoke. "There is counseling and advice for folks on having their children avoid cigarette smoke, but no one is being advised on what to do about marijuana smoke," Goodwin said. The study was published online May 14 in the journal Pediatrics. Make your child smarter and healthier with these brain-boosting meals! Developing brains needs the right foods to boost learning and improve concentration.